The Sin Bin Sports Blog: Do The Bruins Have The NHL's Best Goalie Tandem? 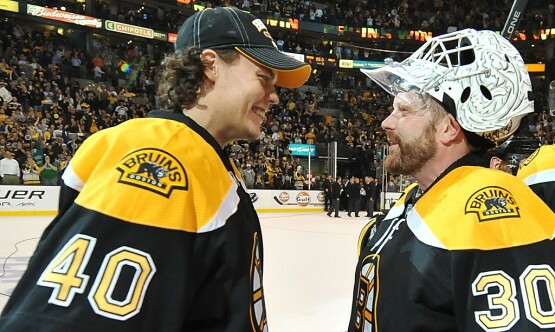 Do The Bruins Have The NHL's Best Goalie Tandem? When looking across the NHL, there are goalies that any team would love to have between the pipes and anchoring their team. However, while some teams have one stud in net, they fall short when their back up takes to the ice. That is not the case in Boston. The Boston Bruins, sit atop the Northeast Division and Eastern Conference, and look poised to make another run at the Stanley Cup, thanks in part to the dominating performances turned out by Bruins goaltenders, Tim Thomas and Tuuka Rask. Through 30 games, Thomas and Rask have backstopped the Bruins to a league best 2.00 goals against per game average, and have turned out overwhelming individual performances as well. First a look at the Bruins' starter, Thomas. He currently has 14 wins, the third most in the league, and a save percentage of .940, the league's second highest. He has three shutouts on the season, and an average of 1.93 goals against a game in 21 games played. Thomas' back-up, Rask, has numbers as good as most team's starters. Rask has won six games, and is right behind Thomas with a .939 save percentage. Rask has one shutout this season, and actually has a lower average goals against per game at 1.82, the league's second best, in 11 games played. Between the two goalies they have faced 35 or more shots in five of their last 10 starts, going 4-1 in those games. With a goalie line-up like that, the Boston Bruins have a chance at winning every night no matter who is in the crease for the defending Cup champs.